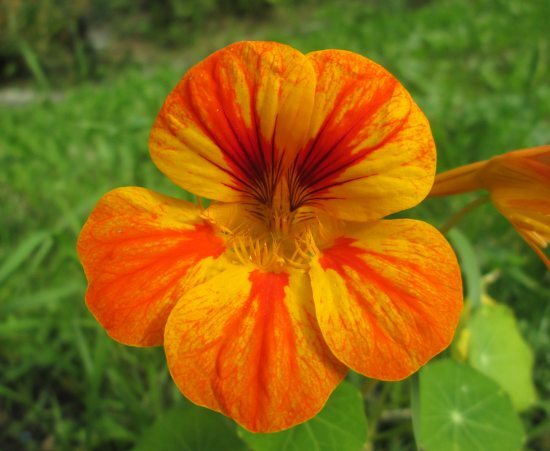 Changing seasons - once again! A wonderful summer has somehow turned to autumn, and tomorrow is October already. 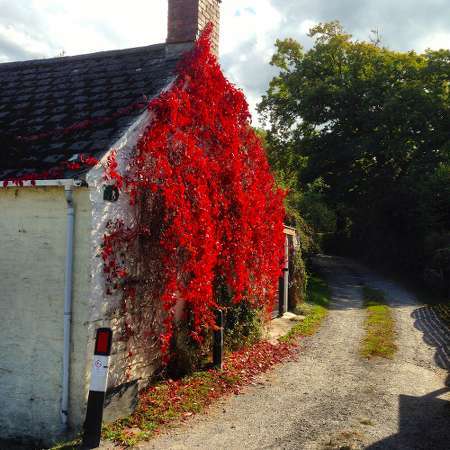 Like the seasons, the years too slip by and we realize that this is our 10th autumn in Wales. What an amazing adventure the Lord has brought us on, and we are so thankful for His goodness to us. After enjoying a busy spell with visitors, we have now been turning our attention to some outside jobs in the garden and enjoying the changing but still dry weather. Farmers are also busy everywhere, crops have been harvested and they are making preparations for the next planting season already. But the scenes depicted here are not strictly work. Each year there are plowing competitions and people come from miles around to watch, or to put their skills to the test. 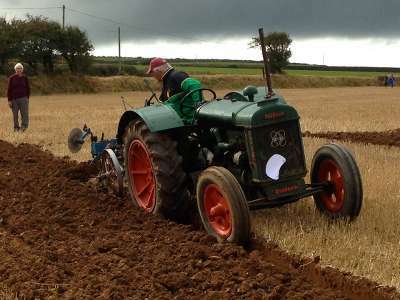 This Saturday was the The 55th All Wales Ploughing Championship held in southern Pembrokeshire, so we made a day of it to join the fun. 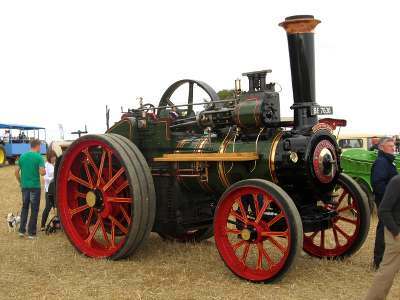 There were all types, sizes and ages of tractors - from real antiques to the most up to date machines. 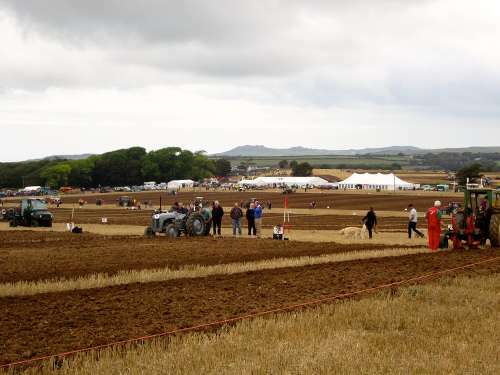 There were close to one hundred competitors, mostly vintage tractors, and each was assigned a plot and judged on the neatness and precision of their work. Everywhere you turned there was activity among a chorus of throbbing engines and churning earth. People gathered in little groups around different areas just watching or asking questions which were gladly responded to by those competing or other knowledgeable bystanders. And besides all the machines were working, there was a fabulous collection of old tractors and equipment, like this beautiful steam tractor. I was a little too close for comfort when the operator blew its whistle, but I can still hear just fine! It wasn't all about machines though. 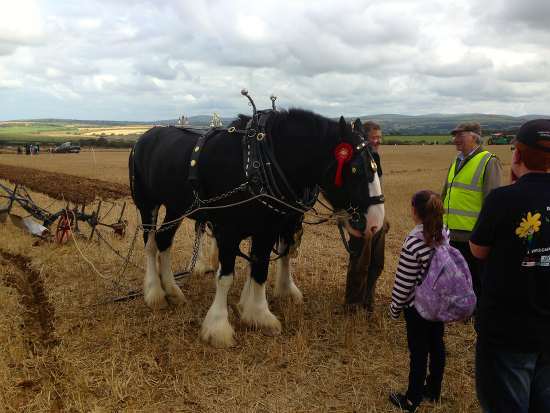 We have friends from North Wales that have plowed with shire horses for years, and this year Wynn was judging that part of the competition. After seeing the big modern tractors racing through their paces and showing off the latest equipment, the contrast was shocking. It was like traveling back in time a couple of centuries. Watching these beautiful animals work is a privilege. You can get a glimpse of it in this video link.They have such power, and yet are gentle and friendly. It is amazing to consider that up until about a hundred years ago, most food production was accomplished through the strength of horses. Working with these noble animals is now almost a lost art, and it is sad to realize that such a vital link to God's creation is all but forgotten. Perhaps it should be no surprise that the Creator Himself has been all but forgotten too by today's industrialized consumer society. Genesis 1:31 says, "Then God saw everything that He had made, and indeed it was very good." Oh that the people of today's world would taste and see that the Lord is good! The past two weeks have flashed by like a fast train, and we have been blessed with more visitors that ome to pray here from other countries. We are always so encouraged and strengthened when the Lord sends reinforcements to pray with us for the coming move of God here in Wales. And we are not the only ones receiving this kind of blessing. 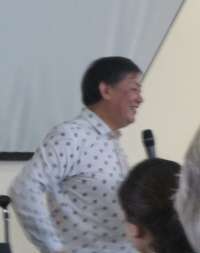 Recently there was a team of close to 400 intercessors from South Korea that came to stand together with many different congregations in England and Wales. 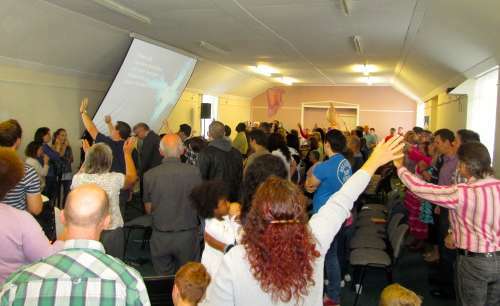 They came to pray and see God strengthening and reviving His church in the United Kingdom. This mission was inspired as an act of gratitude for British missionaries who dediciated their lives to missions in Korea. The previous weekend our old friend Lani Peck came for a brief visit. He had come over for Arthur Burt's funeral service, and then after a visit to the Isle of Lewis of the Hebrides Revival fame, came down to spend some time with us. It was good to catch up after not having seen each other for a while. We share a fair amount of common history, both having been part of Gospel Outreach many years ago. Then last Monday we hosted three Singaporean men who were referred to us by a mutual friend there. 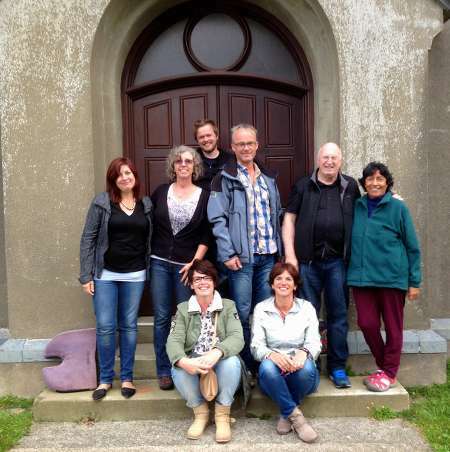 They spent part of their three days at Ffald-y-Brenin center, and we had a great time of fellowship with them. They were fascinated by the story of how we were called here to pray, and also by our early discipleship experience in a Christian community. It is so amazing how the Lord orchestrates all these encounters. 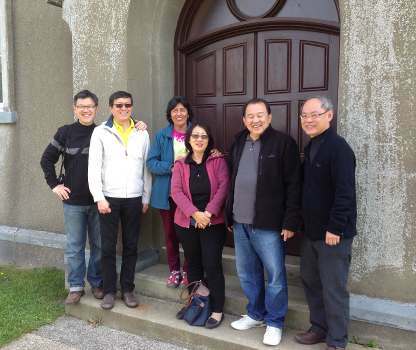 Tuesday when our Singaporean friends were at Ffald-y-Brenin, they met a couple from Malaysia who had been trying to contact us through a mutual friend, but we never heard from them. So when they all met and discovered that we were hosting them they were blown away! So the following day we met together for some sharing and prayer at our chapel, and we had an amazing time rattling the heavenlies through our intercession. Friday morning we spent a marvelous session of spontaneous worship and prayer at the chapel. The prayers of these saints were deeply moving, and we were all greatly encouraged as we spent time in the presence of the Lord together. 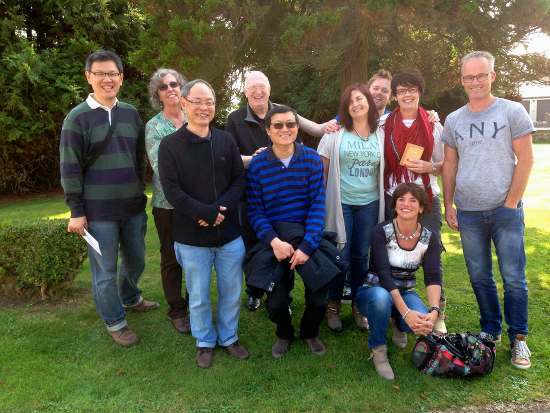 They blessed us with awesome prayers and words from the Lord, and we blessed them and the rest of their time as they followed their prayer assignment through North Wales. 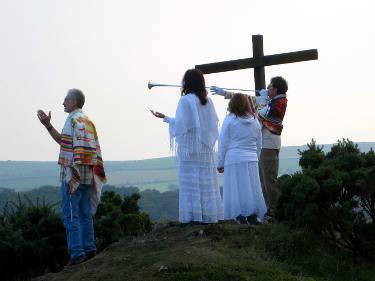 Interestingly enough, they had specifically planned to spend some time of prayer in Blaenau Ffestiniog as well. As thy say, "the plot thickens!" Trains of prayers coming into Wales! 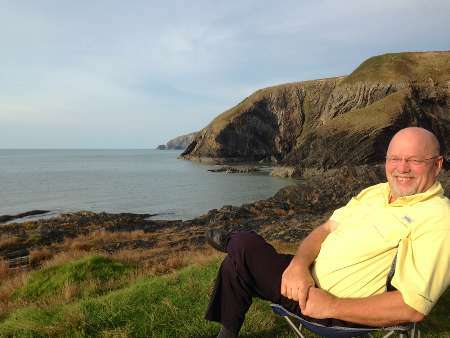 Recently I have been reflecting on how the Lord continues to send people, either in groups or individually, from other parts of the world to come and pray here in Wales. They come to pray for and bless this nation, and many also hope to receive something of the "revival anointing" and carry it back to their home countries. Lately there has been an increase in these groups coming to pray. For example, this week begins the 2014 South Korean Prayer Mission, well over 400 strong, with teams spreading out through England and Wales. Last week we had another team of intercessors with us, this time from Oregon. They are on a specific assignment from the Lord to pray through the four nations of the United Kingdom - Wales, England, Scotland and Northern Ireland. We're glad they came here first! 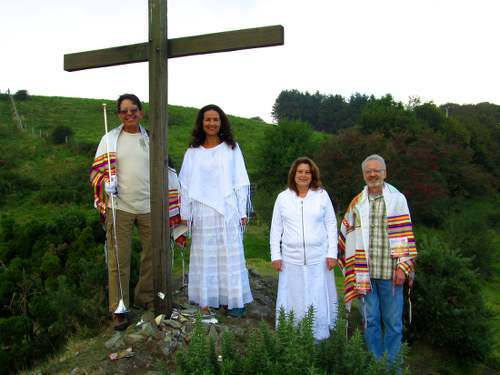 As you can see, one of the brothers has five foot long silver trumpet that he blows in strategic places accompanied by prayer and scriptural declarations over the land. On Thursday I took them to Ffald-y-Brenin where we prayed over Wales, and specifically for the NATO meeting that was taking place in Newport at the time. So the blasts of his trumpet sounded out in that specific direction. A friend of theirs made up specific anointing oils as directed by the Lord in prayer, and part of their mission is to pour these oils into the ground as they pray in each nation. It was a special and perhaps significant blessing on Friday that they wanted to go with us for a time of prayer at "our" chapel, and were led pour the oil for Wales into the ground there. From there we went to the Bible College of Wales in Swansea. They had all been impacted by the book, Rees Howells - Intercessor, and so that was an important place to visit for them. The Sunday before we had just attended the fellowship that was formed on the grounds there last spring, Liberty Church. It was a special occasion as our friend Pastor Yang and his wife from Cornerstone Community Church in Singapore, which purchased the property, was sharing in the meeting and brought a great word of encourgement and exhortation. I was also delighted to find out that as of September 1st they will be having weekday prayer times at the Bible College grounds. These informal meetings are open to all who would like to join in. Specific times and details are available on their Facebook page at this link. And there are others that come to settle here to join in the work of preparatory intercession for what is to come. In the last couple of weeks we've had contact with one couple that moved here recently for just this reason, and it was our privilege to connect them with another couple that moved to the same area a few years ago. Also another small group from the U.S. is making arrangements now to come here to form a prayer community and make their residence in Blaenau Ffestiniog. It just gets more and more "interesting" as time goes on! Pray for revealing of Glory - NATO Summit in Wales! This portion of Ezekiel 3:22-23 caught my attention as he describes this particular encounter with God. "Then the hand of the Lord was upon me there, and He said to me, 'Arise, go out into the plain, and there I shall talk with you.' So I arose and went out into the plain, and behold, the glory of the Lord stood there, like the glory which I saw by the River Chebar; and I fell on my face." Sometimes we might picture the glory of the Lord as a supernatural weighty presence or a bright shining cloud, and we can see these aspects of it in the scriptures. But this description the glory "standing there" seems to hold something more. Rather than it just being there in an impassive way like a cloud or mist, it "stood there" as if with a directed intention, an imposing and confrontative manner. Were it the highest ranking general of the mightiest army of the world, even the lowest ranking soldier would snap to attention. But all Jeremiah can do here is fall on his face! Time and again throughout the scriptures, when God shows up, people hit the dirt! There can be great preaching and teaching, analyzing, hypothesizing and theologizing, and not much happens. But this direct in-your-face type confrontation with the glory of the Lord lays you out flat. End of story! And that's exactly where we need to be. When we pray for revival, what we are really praying for is that people have this kind of experience with God - find themselves directly confronted with His glory, beholding His immeasurable majesty and realizing their minuscule insignificance before Him. We are calling on God for a visitation of His Presence that changes hearts, souls and lives forever. This is what Isaiah means when he cries out in chapter 64 verse 1, "Oh, that you would rend the heavens! That You would come down! that the mountains might shake at Your presence..."
I believe that not only is this a key point in prayer for revival, but also in prayer for the struggle among nations. Isaiah continues in 64:2, "...to make Your name known to Your adversaries, that the nations may tremble at Your presence." While praying for the critically desperate situation for Christians and other non-Muslims in Iraq and Syria, this is so important. The reference to "...the nations..." seems to point to the leaders and heads of state particularly. If they were to have this kind of encounter, like a Saul of Tarsus, or a Nebuchadnezzar, then perhaps the wisdom of God might illumine them and change the course of events. 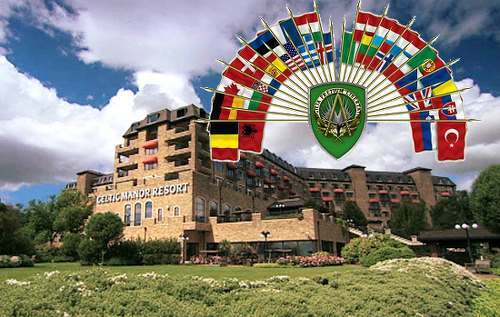 In fact, this Thursday and Friday here in Newport, South Wales, there will be a very important NATO summit meeting. There two massive global security issues - the encroachment of Russia into the Ukraine, and the growing threat posed by IS jihadists in Iraq and Syria. Alongside these in the agenda are the increased threat of terrorism, international cyber attacks and territorial security, as well as a list of other pressing issues. So please join in prayers from around the globe for God's intervention in these meetings. Let's pray that one or more of these leaders have an encounter like those we been talking about. Or if that doesn't happen, pray that the wisdom of God would find its way into any resolutions made.